Patriotism was of the utmost importance to many new immigrants. One such immigrant was Thomas Ostenson Stine who was born in Vestre Slidre, Oppland, Norway on November 11, 1865. He was baptized Tollef Ostensen Steine on February 4, 1866. He emigrated to America in 1882, at the age 17. In an brief autobiography published in the forward to a book of poetry: Heaven on Earth (Seattle, Pigott Pr., 1920), Stine writes, "In 1890 I took out my final citizenship paper in the circuit court of Brookings [South Dakota]. The question then arose regarding the Americanization of the spelling of my name without losing the identity of the Valders farm -- Steine. ... Some time later I conferred with Dr. George Lilley [at South Dakota Agricultural College and now president of the Washington Agricultural College and School of Science], my good, old teacher, regarding the spelling of my name. He stated that Steine looked better to him than Staine, but suggested that it be spelled -- STINE." Mr. Stine traveled to the Pacific Coast via the Canadian Pacific, landing in Seattle in the early part of March, 1891. He became well known in the Pacific Northwest as a teacher, newspaper correspondent, author, and poet. 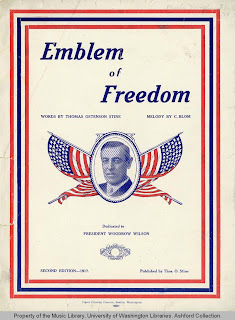 A new patriotic song entitled "Emblem of Freedom," has just been published. It is in every sense expressive of true American spirit, and will undoubtedly be met with warm sympathy by the public. The words are written by Mr. Thos. O. Stine, the first graduate of the Washington Agricultural College and School of Science, who is well known to the people on the Sound as a teacher and newspaper correspondent. The melody is by Mr. C. Blom, a noted composer. Both the words and the music are strong and spirited and bear marked indications of literary and musical power. Courage and love that our fathers have shown. Pride of our country, the flag of the brave! Deeds of our fathers that sleep in the grave. Presents to battle for liberty flee. "Yankees forever unconquered and free." Gallantly hoisted as onward they bore. 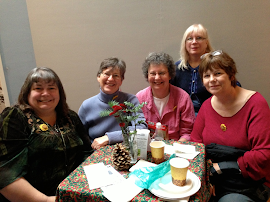 "Emblem of Freedom" is gaining recognition among the prominent educators in the East. 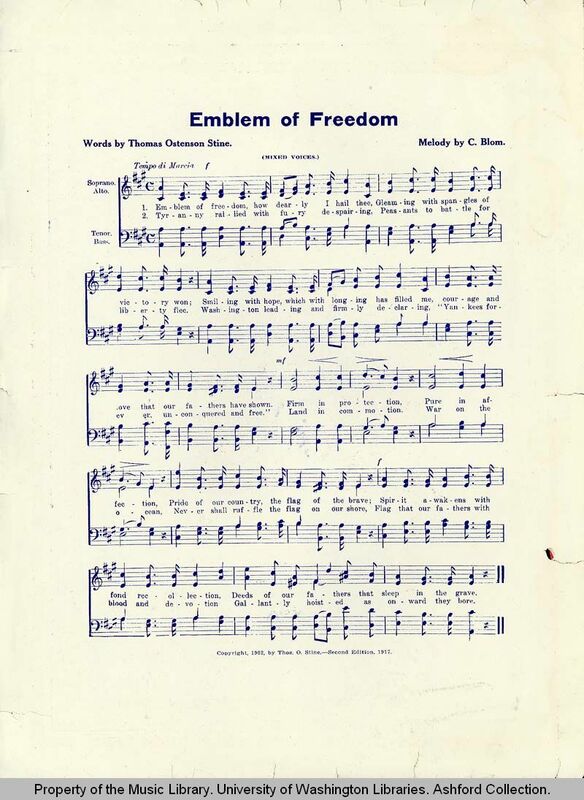 The Missouri School Journal, a leading educational magazine, published the whole song in the April number and also gave considerable editorial space to it. 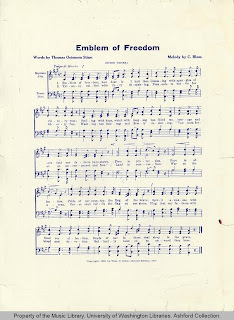 Among other things the Journal said: "Teach your children to sing 'Emblem of Freedom,' the words and music of which are found on another page of this issue, furnished us by the author Mr. Thomas O. Stine of Seattle, Wash., that our readers may have an opportunity to become acquainted with this delightful piece of music." According to present indications the the song will be adopted for use in the public schools throughout the entire United States. The majority of the state superintendents of public instruction have offered to introduce it into the public schools. Even the State of California, which is one of the most independent states in the union, has given the song recognition. 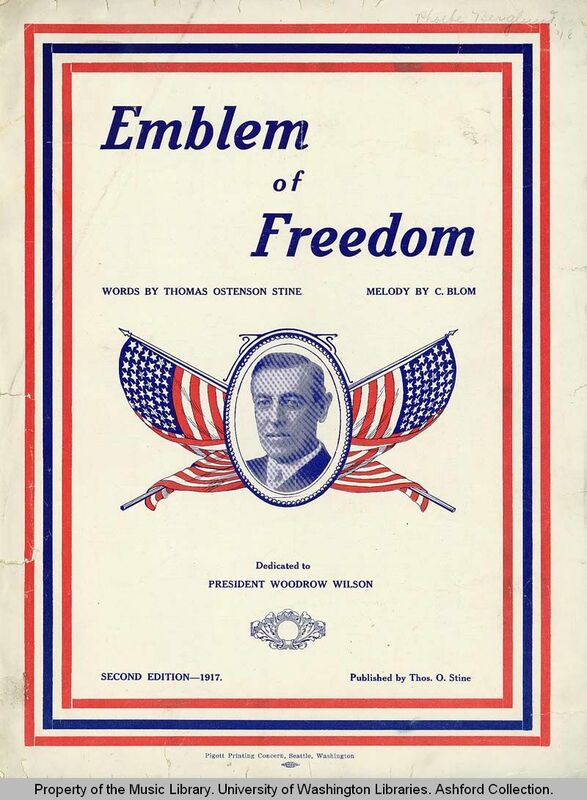 Prof. Thomas J. Kirk, state superintendent of public instruction of the Golden State, wrote the author of the song, in part, as follows, February 21, 1903: "I beg to acknowledge receipt of yours of the 21st inst., together with copies of your song, "Emblem of Freedom." It will give me pleasure to recommend it as one appropriate to be sung in public schools." State superintendents of instruction of other states have expressed themselves equally pleased with the new patriotic song, which has already been adopted for use in public schools of a number of cities. I'm in direct descent of him.